As part of its centennial celebration, JC Whitney, the gigantic auto parts and accessories company, has searched the archives of its catalogs to find the 10 oddest auto accessories it ever has offered. It was in 1915 that Lithuanian immigrant Israel Warshawsky opened a metal scrap yard on the south side of Chicago. 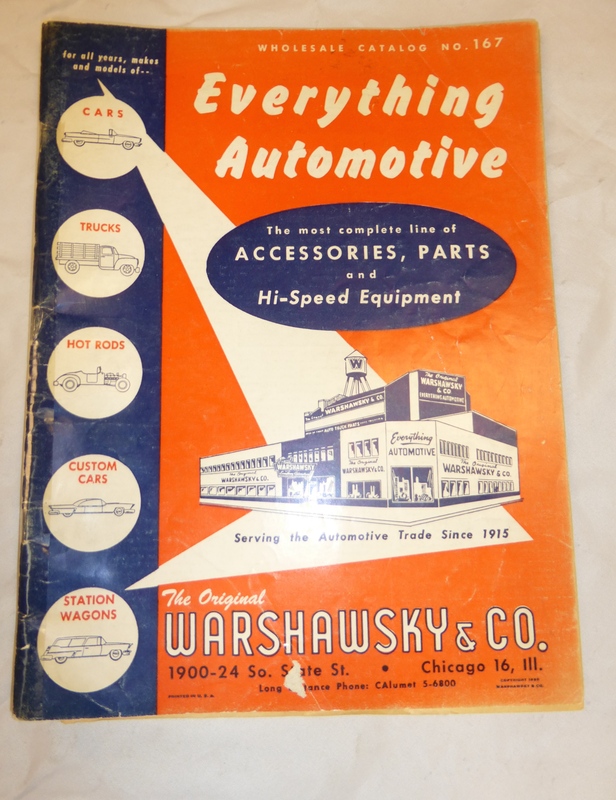 The Warshawsky Company sold a lot of used auto parts, and Warshawsky had the foresight to buy up the parts inventory of struggling American auto makers as they were going out of business. Warshawsky’s business really picked up after his son, Roy, graduated from the University of Chicago and joined the firm. 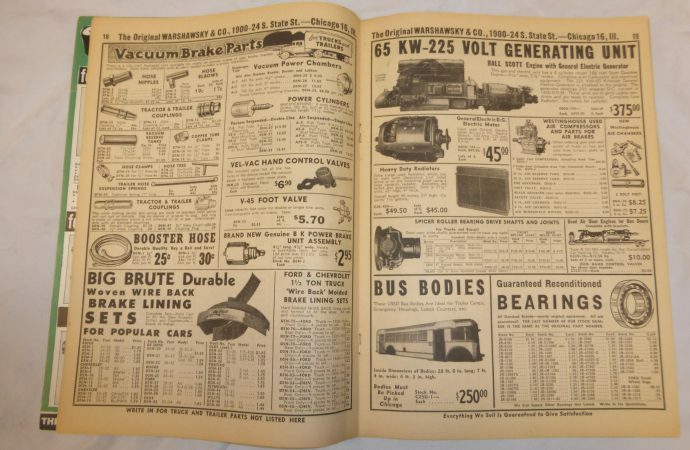 It was Roy who thought they could sell auto parts and accessories nationwide and spent $60 for an advertisement of the renamed JC Whitney company in Popular Mechanics, promising to send a “giant auto parts catalog” to anyone who sent 25 cents to cover shipping and handling costs. Door Re Me Door Chime. A music box that plays a song melody when the car door opened, this accessory offered an easy way to class up your ride… and surprise that special someone. 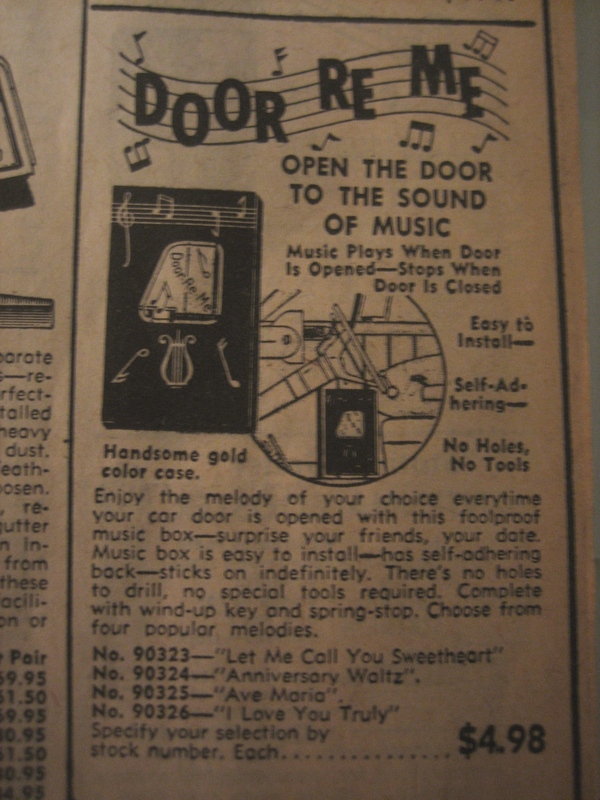 Available in four different versions, including “Ave Maria,” “Let Me call you Sweetheart,” the “Anniversary Waltz” and “I Love You Truly.” Vintage sale price in the 1960s: $4.98 per selection. Fuzzy Car Muffs. Because cold weather makes people loopy enough to put fuzzy warmers on their cars. What was promoted as a “countrywide rage” featured wrapped fuzzy white fur over mirrors, horn rings, visors and car club plaques. It’s like driving a polar bear! Vintage sale price in the 1960s: $0.79 – $1.50. Dashboard Record Player. Was this an early version of the aux port? The integrated mp3? No. But it was an interesting idea: Hook up a portable record player to the car radio. It played 45s with the claim that it “Performs smoothly even over rough roads, rough curves, even during fast starting and stopping.” There were also full-size record players available for travel trailers during the ’40s and ’50s. Vintage sale price in the 1960s: $59.95. Actual Race Recordings/Sports Car Recordings. The precursor to audiobooks, perhaps? How about a spoken word biography of Carroll Shelby or Sir Sterling Moss. You could get it in the JC Whitney catalog and, of course, play them on your on-dash record player. Recordings of famous races at Le Mans, Monaco or Silverstone were included. Vintage sale price in the 1960s: $5.00 – $5.95. 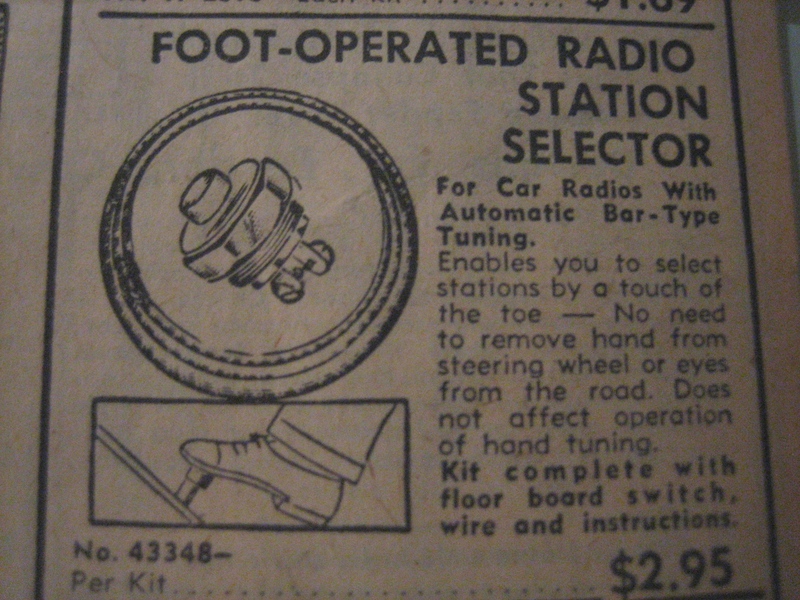 Foot Operated Radio Selection. Serious drivers want to know: Why move your hands from the wheel to tune the radio when you can do it with the tap of your foot? And what’s the difference between this and today’s advanced head’s up display telematics? Vintage sale price in the 1960s: $2.95. Automotive Radio Phone & Accessories. Once again demonstrating that JC Whitney was on the cutting edge of in-car electronics and accessories. Well before the cellular revolution arrived, it took specialized equipment to turn your car, truck or boat into a low-power radio station to conduct business and stay in touch with family. Here was everything you needed, including the transmitter/receiver and antenna to give you a range of up to 10 miles. Unintended benefits included looking like a business mogul or law enforcement officer to passers-by. 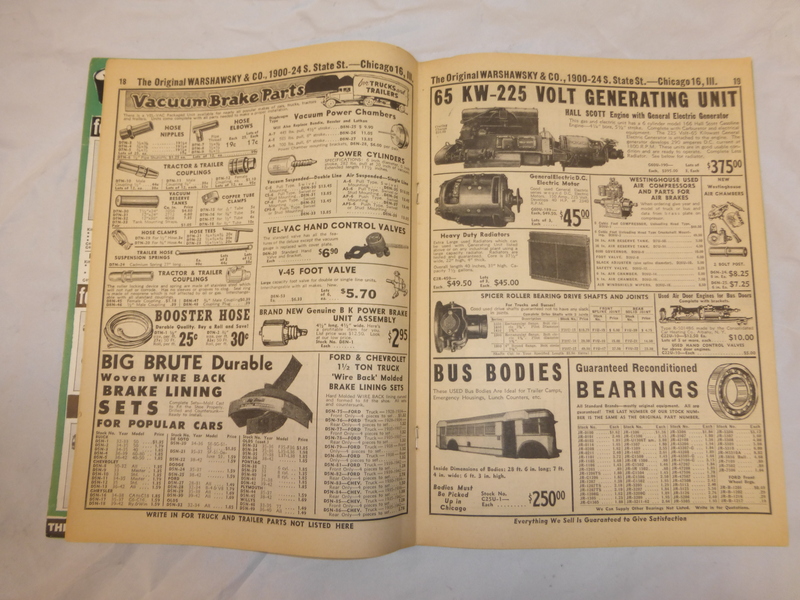 Vintage sale price in the 1960s for multiple components from $0.65 to $169.00. Gyroscopic Stabilizers. Anything that has the word “Gyroscope” in the title is sure to get car fanatics dreaming about the scientific possibilities of whizzing widgets. The stabilizers claimed to increase tire life, automatically balance wheels, iron out bumps, improve handling and do your laundry. Vintage sale price in the 1960s: $19.95 (set of two). 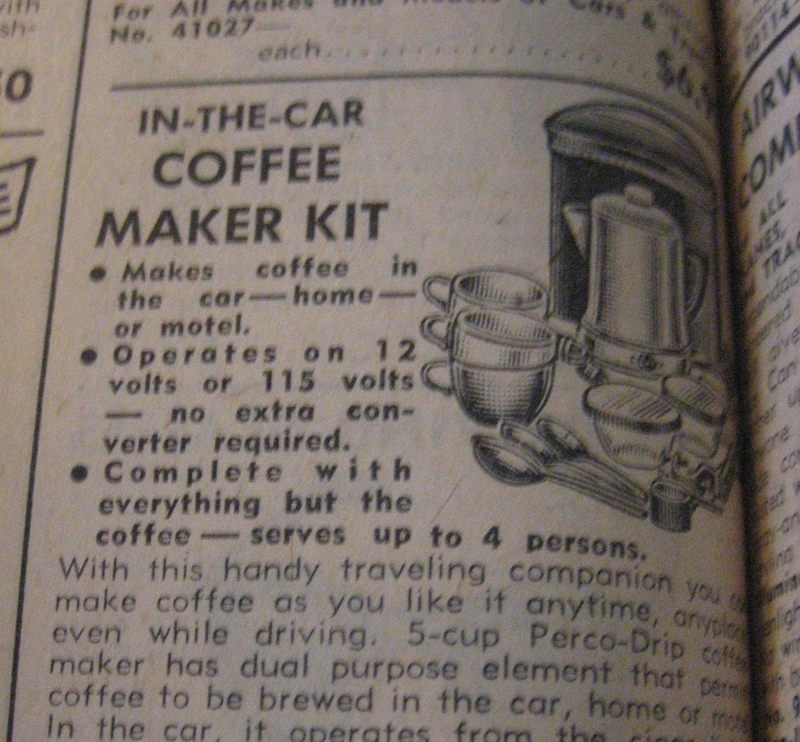 In the Car Coffee Maker Kit. A brilliant product that never made it to the big time, this idea came around long before Starbucks was on every corner: This kit served four cups of coffee. For the price of a few tall lattes you received all of the items to percolate, pour and organize your cream and sugar… all while securing the coffee maker while you rushed to work. The perfect accessory for cupholders! Vintage sale price in the 1960s: $17.00. Deluxe Left Foot Accelerator. Give the right foot a rest from all that tiring movement! Ad copy boasted benefits like “Rest the right foot” and “easily install on any make or model car… with or without a clutch.” A popular modification for drummers who wanted to practice their footwork while driving. Vintage sale price in the 1960s: $3.98. Winky and Friends. Whatever happened to Duchess and Mac? Just like a musical super group, these plush characters enjoyed some success in the JC Whitney catalog until Duchess and Mac left to pursue solo careers in the automotive turn signal and brake light industry. A reunion has been discussed. 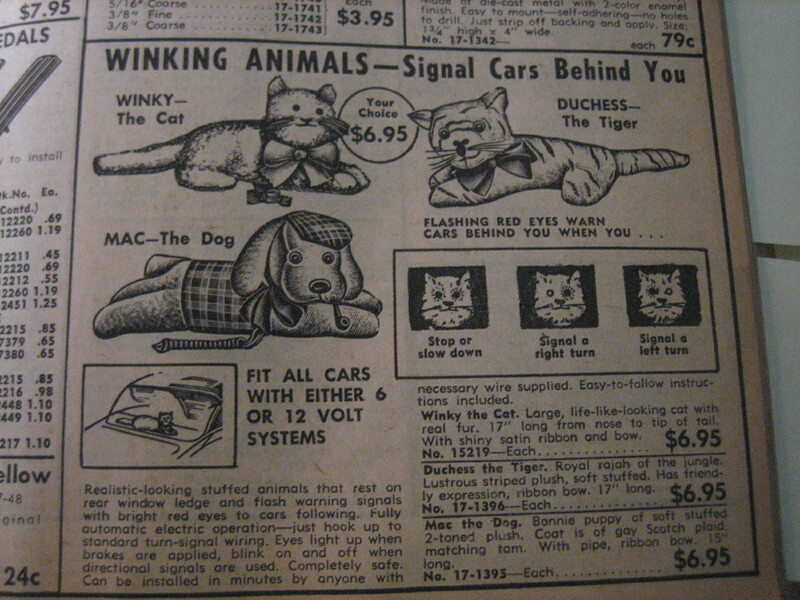 Winky was sold in the catalog until around 1987. Vintage sale price in the 1960s: $6.95 each. For more on the JC Whitney centennial, see the company’s special website.